As the name suggests, the Royal KonTiki Chronograph is born of a long line of illustrious predecessors which have characterised Eterna’s collections for decades. Like those, it is highly functional, reliable, robust and tough. 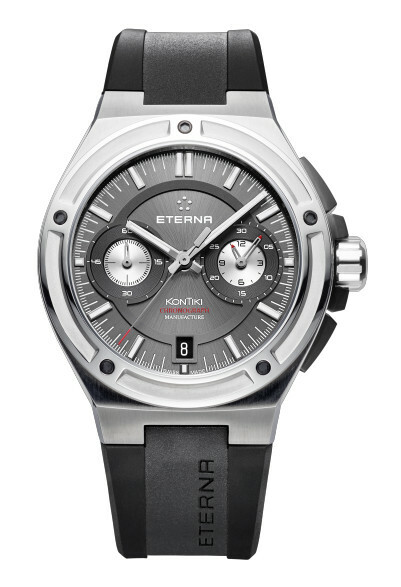 However, it would not be doing justice to this new timepiece to reduce it simply to these attributes: after all, the movement ticking away inside the chronograph is an innovative development by Eterna itself and therefore worthy of special attention. This new Royal KonTiki model is one of the first chronographs from Eterna to have a movement that the company has manufactured itself. Because of the revolutionary modular nature of the Eterna basic movement 39, it has been possible to add a self-winding mechanism, a chronograph with flyback function and a date display to create the calibre 3916A. Its outstanding accuracy as a chronometer, together with the guaranteed 65-hour power reserve, make the Royal KonTiki Chronograph a reliable partner at all times for modern adventurers and individualists. Entirely in keeping with its fabled predecessors from Eterna, the new Royal KonTiki Chronograph is characterised by a strong, masculine design. The robust, 42.55 mm stainless steel case, optionally also available with black PVD coating, creates an impression of strength at first sight. This is due primarily to the entirely unmistakeable bezel. 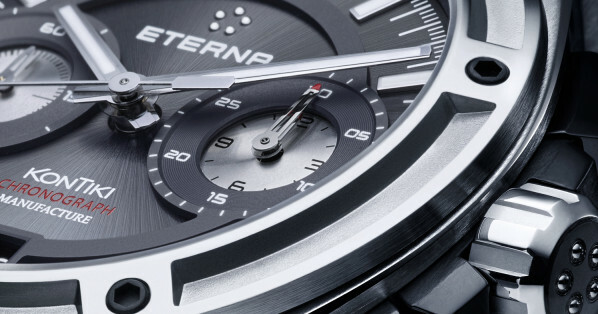 Its main features are the pronounced circular elements and five black PVD-coated screws arranged in the shape of the famous Eterna logo. The chronograph buttons are also coated with black rubber for ease of use, while the crown protector is made of blackened steel. 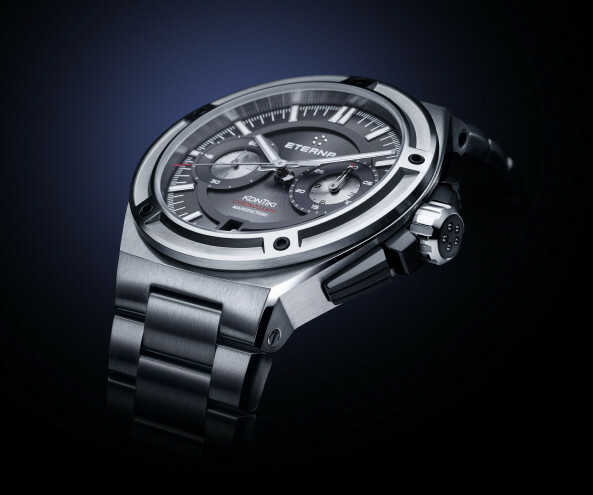 The watch embodies strength, mechanical perfection and accuracy. Different levels create interesting tension in the harmonious dial which has been kept a restrained anthracite colour. The discreet engraved sunburst motif in the centre, the 30-minute and 12-hour timer at 3 o’clock, the little seconds display at 9 o’clock and the date window at 6 o’clock are enclosed within a raised ring, while the silver-coloured centres of the subdials are slightly recessed. The applied, white SuperLuminova-coated hour indices and the striking, similarly luminescent hour and minute hands stand out boldly against the dial to guarantee outstanding legibility. Additional contrast is created by the tips of the chronograph hands, which have been dipped in luminescent red. The silver-coloured numerals on the two subdials and the date display stand out starkly against their black backgrounds and are perfectly legible even in poor light conditions.